Y11 Student Robert Wilson in Motorsport Success! Robert Wilson, one of our Y11 students started his 2019 competition car rallying campaign in style in early March by winning the Questmead Stages event in Wigan. Rob is participating in his third season of junior motorsport which enables 14 to 17 year olds to participate in National Rallying events. The junior formula uses cars with 1.0 litre engines with no modifications to either the engine or gearbox. However the cars have competition suspension, brakes, are lightened to the minimum class weight by the removal of all un-necessary items and are fitted with full roll-over cages and other safety equipment. The championship is highly competitive with several past juniors now competing at the very top of the sport including the World Rally Championship. In his first season Rob used an older Nissan Micra and immediately achieved many impressive results regularly beating the more modern and quicker cars resulting in him winning the category for the Pre-2003 cars in 2017. 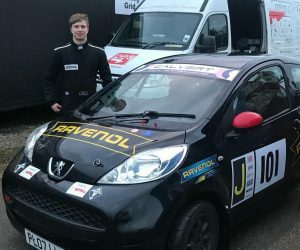 In 2018 he stepped up to running a Peugeot 107/Citroen C1 which is one of the leading makes of car in the sport. He immediately set the pace by winning his events outright. A few unfortunate situations during the season however thwarted his overall championship hopes. These included a puncture when leading an event in Pembrey and going off the road on the final stage of an event whilst in the lead at an event in West Wales after hitting a large patch of oil. He did however win the season finale in style by a large margin after two days and a night of competition. He received a Spirit of the Championship award at the season end from the Championship organisers due to his spirited yet controlled driving style that together with his main rival had made the championship so exciting. Starting the 2019 season on a high note by winning the first round of the championship is a real positive especially when coupled by the social and printed media comments about his fast and attacking, yet well-judged driving. It is a long season, finishing at a two day event, which includes night driving, in Anglesey at the end of November. The competition this year will once again be fierce and Rob will also be missing one of his favourite events which is immediately prior to the start of his GCSE’s. He is very focussed on success in both his GCSE’s and his Motorsport. We look forward to hearing more about Rob having a safe yet competitive motorsport season in 2019.